Toronto, ON (July 19, 2017) — If you’ve ever felt like there’s not enough time in the work week, your cell phone and list of errands may be to blame. Canadian professionals surveyed by staffing firm OfficeTeam said they squander an average of 43 minutes per day, or the equivalent of more than three and a half hours a week, using their mobile device for non-work activities in the office. 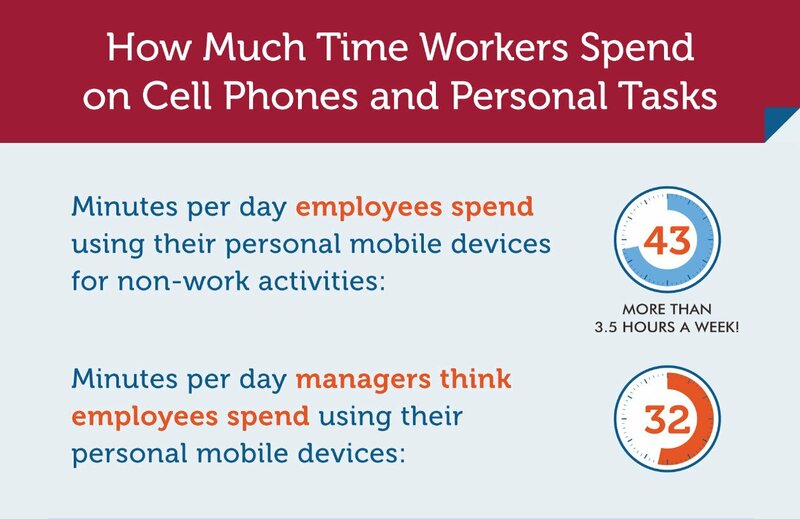 In contrast, senior managers estimate their staff members spend 32 minutes each day on their cell phones during business hours. Workers also admitted to clocking 40 minutes a day on personal tasks. All in all, the average employee could be wasting nearly 7 hours per work week on activities unrelated to the job. Employees ages 18 to 34 rack up 58 minutes a day on mobile devices and 52 minutes daily on activities unrelated to their jobs, the most of all age groups. While 38 per cent of managers think staff spend the most time on social networks when using their own mobile devices during business hours, workers said they’re most occupied by personal email (35 per cent). Workers reported social media (27 per cent) and entertainment web pages (19 per cent) are most commonly blocked at their companies. More than half of respondents (58 per cent) indicated their organization doesn’t restrict access to online content. Respondents ages 55 and over most frequently check non-work email on their cell phones (45 per cent). Workers ages 18 to 34 are the group most likely to peruse social networks (29 per cent). More than one-third of employees (35 per cent) often use their personal devices at work to visit pages that are banned by their company. Which may come as a surprise to 60 per cent of managers, who think it’s more common. Forty-one per cent of male workers frequently use their cell phones to access blocked websites in the office, compared to 29 per cent of females.